How to develop leadership in sports. Knowledge is gained through cognitive understanding. Beliefs and attitudes are created through life experiences. We feel the power of pulling together for a shared purpose. We feel the energy of the team, the players and the coach. We feel the intensity of the ‘moment’ – whether positive or negative. We all require a safe environment to grow and develop, as individuals and as players. There is a requirement for both physical safety and psychological safety. The physical barriers may be visible and easy to recognize. The psychological barriers are not. Coaches, players and parents work very hard to cover these limitations, often because the reaction does not feel rational. The triggers to these reactions are often sensory perceptions unique to the individual so that no one else may be experiencing the trigger. Our drivers of be strong, try hard, hurry up, please others and be perfect (Kahler’s Drivers) kick in and as the pressure mounts they can become dysfunctional. The environment no longer feels safe. Our normal response? We increase the intensity and our level of safety further diminishes. Every game has a set of rules. We know the parameters by which we operate. Although they may be open to interpretation or may not be executed properly in all games, it is our responsibility to learn and follow the rules. When we don’t play by the rules, we are subject to penalties, fouls and game ejections. There is incentive to learn to play smart, within the set parameters. When the rules are not properly enforced, players find it very difficult to perform to their potential. If we do not establish proper boundaries to protect individuals within the team, there is not safety to grow and develop. We all bring our individual beliefs and cultural attitudes to the gym, the rink or the field. Players and coaches. In most cases, the coach does what he believes is best for the team and for the players but we need to recognize that this is based on his perspective. And our perspective is based on what we learned from his parents, coaches and teammates. In a relaxed environment, there may not be significant tension between our knowledge of how to coach and our beliefs and attitudes about what the players should be doing. However, during the most intense moments of the practice or game, we can easily trigger old perceptions that activate some intense emotions. The result? Our reactions take over in the heat of the moment. These reactions may not be rational but we (strongly) believe that we are right. Sports provides a wonderful opportunity to develop valuable leadership skills, provided the coach can create an environment where team members feel safety to grow and boundaries that protect. We all inevitably have less desirable experiences that get stuck – images, sounds and other perceptions that activate us during practise or games. We have the opportunity to identify, isolate and neutralize these triggers using the Logosynthesis® method so that we can release habitual patterns that hold us back and limit our performance. Coaches, players and parents all have a role to play in both creating a safe environment and in supporting each other to release the triggers that impede performance. A team is stronger together and each person has a role to play in holding this space to grow and develop. 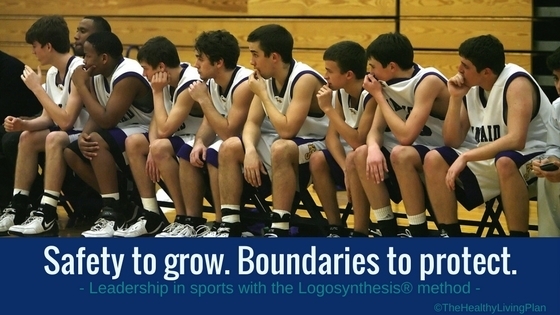 To learn more about how the Logosynthesis® method can support your team or organization, contact us.